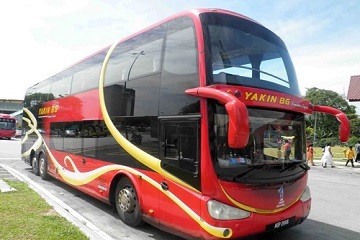 Yakin BG Express is among the many familiar bus companies in Kuala Lumpur with routes heading to destinations such as Johor Bahru, Alor Setar, Butterworth and more. They operate at bus terminals which are easily accessible for their passengers, providing a sense of convenience for their passengers to get to their pickup points. Their coaches are fully air conditioned with ample of leg space for passengers to stretch and bend their leg whenever needed. Reclining seat only adds to the already comfortable seats, overall equating to a great travel experience. Its fast paced growth has allowed them to control more than 15 coaches at the same time manage Sri Maju coaches, which provides routes to destinations within Peninsular borders as well as beyond them to places like Hat Yai and Singapore. Wide range of routes to various parts of Peninsular Malaysia, Singapore and Thailand. Operate at various bus terminals across Peninsular Malaysia, Singapore and Thailand. CatchThatBus offers online bus tickets to many routes covered by Yakin BG Express as well as seat availability features. You can book your bus ticket online from our website or via mobile app which can be downloaded for free on Google Play or App Store.